(Newser) – There are two Americas, according to JPMorgan Chase CEO Jamie Dimon: In one, people are benefiting from corporations that are doing well. In the other, however, people are really struggling. "I don't want to be a tone deaf CEO," Dimon said, per CNBC, at the bank's New York headquarters while launching a new program meant to increase job prospects for people in underserved communities. "While the company is doing fine, it is absolutely obvious that a big chunk of [people] have been left behind. Forty percent of Americans make less than $15 an hour. Forty percent of Americans can't afford a $400 bill, whether it's medical or fixing their car. Fifteen percent of Americans make minimum wages, 70,000 die from opioids [per year]." He added, per Yahoo Finance, that millions of jobs are currently available but people aren't graduating with the skills they need. If he is so concerned, why doesn't he share his millions with the poor? What is stopping him from just paying lip service by joining the current socialist trend but not giving up his own money? Funny how that works. 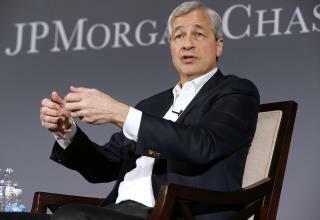 We're supposed to care what Dimon says? America is still the land of opportunity. Marketing strategies have gotten people to believe they can spend their way to happiness though. There are so many more things to grab your attention than there was 30 years ago, and most consumers can't say no.